This section discusses how best to deploy Power Manager on a network. A walk through details one means of deploying on a small to medium sized network. 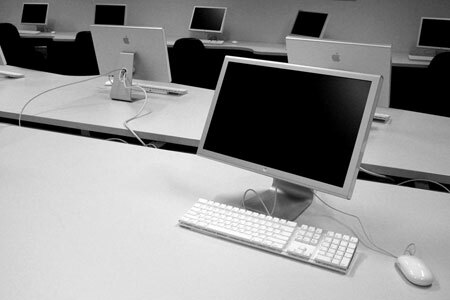 Mac lab photo covered by Creative Commons Attribution-ShareAlike 2.0. Deploying software on larger networks requires a dedicated distribution mechanism. We highly recommend using a tool such as Apple's NetInstall, Apple Remote Access, or Radmind. If you do not have access to distribution software, or are just curious about installing Power Manager on a subset of your network, we present a method below that uses only tools included in Mac OS X 10.3 and later. The following technique shows you how to install software distributed as Installer Packages. The technique requires Mac OS X 10.3 Client or Server. A copy of DssW Power Manager. Remote Login provides Secure Shell (ssh) support allowing remote users to login in securely. You can enable Remote Login through the System Preferences > Sharing preference pane. You need to get a copy of Power Manager onto each client Mac. This can be performed in numerous ways. We are going to assume clients do not have Internet access and instead we will distribute Power Manager from a local server to our clients. You are going to transfer a copy of Power Manager to each Mac on your network via secure copy (scp). This process is much easier if you only need to transfer a single file. The bundle of files you want to copy is called DssW Power Manager.mpkg. This bundle is found in the Power Manager download. 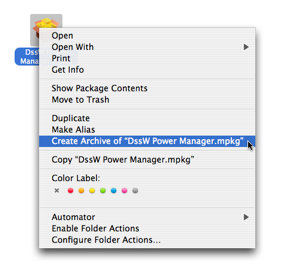 Create an archive (ZIP file) of the DssW Power Manager.mpkg bundle using the Context Menu (Control-click the package icon). You now have a compressed archive containing everything you need to deploy Power Manager across your network. The deployment process can be reduced to the following series of Terminal commands. scp ~/Desktop/DssW\ Power\ Manager.mpkg.zip admin@192.168.1.3:/tmp/. If you are not familiar with the command line, these commands can be intimidating. Don't panic. Let's step through each command so you understand what it is doing and what options you need to change for your network. The following steps work through the seven commands above. These steps install Power Manager on a single remote Mac. 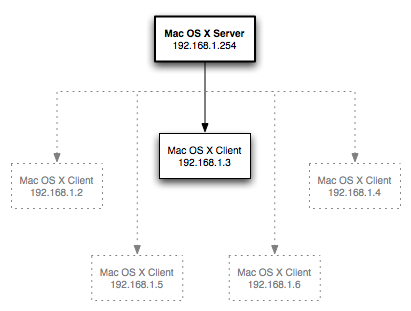 The diagram above highlights the Macs you are working with and associated IP addresses. You need to know the client's hostname or IP address. The first step copies the compressed archive to the client Mac. You need to change three components of this command. ~/Desktop/DssW\ Power\ Manager.mpkg.zip = Path to the archive. admin = An administrator's username on the client computer. 192.168.1.3 = The client's hostname or IP address. If all goes well, the archive is now sitting on the client ready for installation. The decompression and installation process takes place on the client Mac. This ssh command starts a secure session with the client. All commands until exit are now sent over the network to the client. You need to change two components of this command. admin = An administrator's username on the client Mac. These two commands move into the directory you copied the archive to, and unzip the archive. If all goes well, you will see a list of decompressed files after issuing the unzip command. This command does the work of installing Power Manager on the current system drive (/). It is the work horse of the graphical Installer utility. You must restart after installing or removing Power Manager. The next command restarts the client Mac. Finally, the exit command closes the secure session with the client. You have now installed Power Manager on the remote client. You need to repeat these steps for each Mac on your network. You have learnt how to install Power Manager on a remote client without anything more than the standard tools provided in Mac OS X.